Digital marketing is a zero-sum game – it’s survival of the fittest. Brands have to respond to changing customer needs and new technology like artificial intelligence as otherwise they are likely to go out of business. What if you could use artificial intelligence to replicate evolutionary pressures to automatically adapt and adjust your site according to what has the highest conversion rate? And if your audience changed, perhaps due to a TV campaign, wouldn’t it be great if your site responded by optimising your user experience for the new audience profile? But rather than only improving a single page, what if it could use artificial intelligence to simultaneously optimise multiple pages in the user journey? Well, with the advent of artificial intelligence based evolutionary algorithms this time has arrived! Sentient, a company born out of the minds that developed the technology behind Apple’s Siri, has come to market with Ascend. Sentient have combined evolutionary computation (a form of artificial intelligence which uses mechanisms inspired by biological evolution), and deep learning to create a market leading optimisation solution. What is unique and exciting about Ascend is that it is capable of autonomous decision-making to assist businesses improve their bottom line and enhance the customer experience at the same time. What are the benefits of Ascend? Massively complex multivariate tests that have over 1 million possible combinations can be completed with Ascend that would be impossible with traditional MVT solutions. Below is an example of the kind of test that is now feasible with Ascend. Ascend requires lower traffic levels than traditional optimisation solutions because it uses what it discovers about the performance of a particular combination of elements to predict how that combination will influence the conversion rate in the future. Testing is completed with greater speed and double digit uplifts in conversion rates are normally achieved within the first 2 months of employing Ascend. Recently completed tests have achieved between a 12% and 48% uplift in conversions. It can optimise multiple pages simultaneously to improve conversion rates throughout a user journey. Indeed, for underwear brand Cosabella, Ascend tested 15 different changes to the homepage header, category page, product page and shopping cart design. Using standard multivariate testing would have required 160 tests, instead of the automated process that Ascend manages for you. This improved conversions by 35% compared to the control experience. Automates the testing program so that once all your ideas have been input into Ascend it employs all the power of AI to adapt and respond to user interactions to identify the best performing combination of changes to your site or web app. It allows for tests to be paused and new ideas to be input into the testing program as and when required. Automatically adapts to a change in the visitor audience profile without the need for any manual intervention. To give the evolutionary algorithm a purpose it is first necessary to define a fitness measure. With conversion rate optimisation (CRO) the fitness measure should be the conversion metric that you wish to optimise for such as sales, revenues, average basket value, first time deposit or sales leads. It is important to take care in selecting your fitness metric because it needs to be a characteristic that makes one experience (or algorithm) better than another. With an evolutionary algorithm each page (i.e. a selected combination of elements) is classed as a genome and it uses genetic operators (i.e. selection, mutation and crossover) to create and maintain genetic diversity. In the example below two high performing pages (see column on the left) have been identified through selection (i.e. survival of the fittest). However, a further generation of solutions can then be created through crossover (i.e. 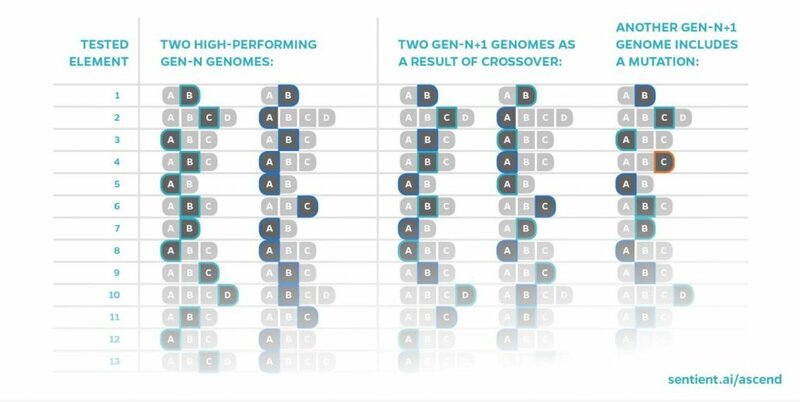 recombining elements from the two high-performing genome) to create children; the middle solutions above. 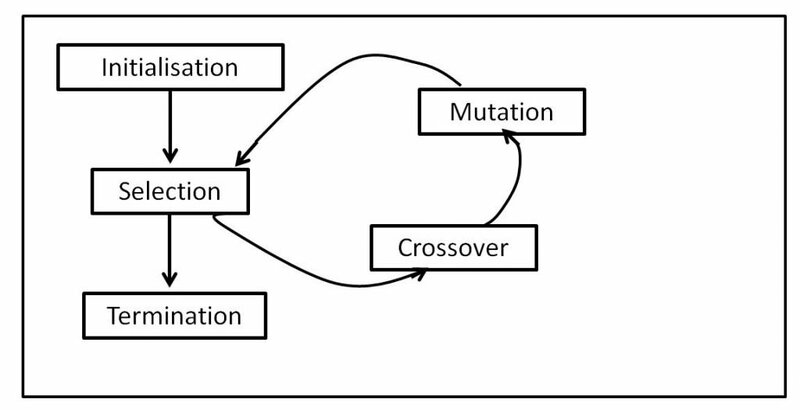 Mutation (i.e. randomly altering one element in the child’s chromosome) encourages diversity amongst solutions and seeks to prevent the algorithm converging to a local minimum by avoiding solutions becoming too similar to each other. This is shown in the right column above. Although each operator individually seeks to improve the solutions generated by the algorithm, the operators work together with each other to create an optimal solution that would not be possible if they were used in isolation of each other. In the first instance the algorithm simply evaluates each page (i.e. genome) to identify if it performs well enough to be a parent for the next generation. Otherwise it will be rejected. This allows literally thousands (out of millions) of experiences to be tested in a short space of time. But as Ascend learns which combination of elements create the best performing designs it automatically adjusts experiences according to how visitors respond. Below is an example of changes that Ascend can evaluate as part of single multivariate test. 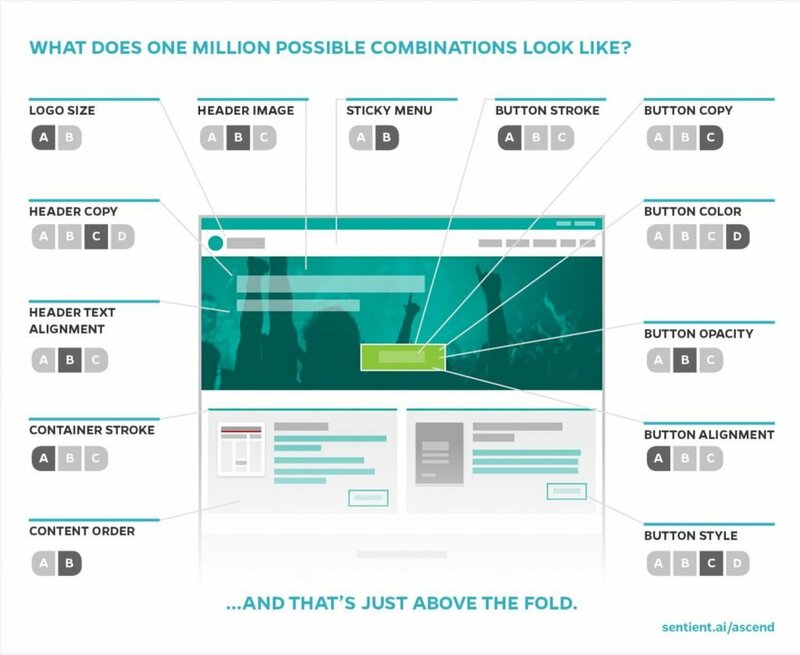 The advantage of this technology is that it can create page designs that convert better than those designed by people because it automatically searches for unexpected interactions between elements. It is also doesn’t suffer from human misconceptions or biases, which means that it can generate surprising ideas that we might never have thought of ourselves. Like any optimisation software Sentient Ascend relies on the quality of ideas and designs to generate uplifts in conversion. It is therefore essential to invest in the people who will be using Ascend to ensure they have the required skills and support to get the most out of this amazing solution. To generate a sufficient quantity of ideas and designs for testing will take some time and resource as you are essentially compressing twelve months or more of testing into a single month or two. This is an analytical and creative process and so it will require the input and approval from various stakeholders if it is to be a success. To keep Ascend fed with additional ideas after the initial test will also require further planning and support to ensure you get value for money from the solution. There is certainly a danger that rather than focusing on quality hypothesis users might be tempted to throw every idea into the mix without proper evaluation and prioritisation. This would be a recipe for a sub-optimal result as with any model if you put garbage in you will get garbage out. As with any multivariate test it is advisable to run an A/B test to validate the winning experience. However, no worries, Ascend can manage this for you or you can use your existing A/B testing solution to conduct the experiment. Sentient Ascend makes most existing testing software obsolete because it offers an automated platform for massively multivariate conversion optimisation. The use of artificial intelligence in conversion rate optimisation allows you to test an enormous number of ideas in a shorter time period than is possible with existing solutions. It is also more efficient at discovering new combinations of elements that result in uplifts in conversion due to the evolutionary nature of the algorithms. Further, as you can add new ideas as you test you don’t need to wait for the test to end to respond to changes in campaign execution or strategy. You can just keep testing continuously if you have the ideas. Note: Conversion Uplift is now an accredited partner for Sentient Ascend.